THE North American Thoroughbred racing industry is rife with the natter of race day and other medications where polarized delegations continue to vehemently argue in defense of their convictions one way or another. 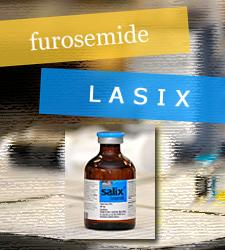 Lasix (furosemide), now renamed Salix for use in animals, is central to the debate, a debate solely North American in nature, foreign to the global racing world and a contentious issue that seems without resolve. Nonetheless the debate and tentative solutions to it seem to be, at a snail’s pace, moving forward, albeit mired in rhetoric and with many impediments much to the chagrin of the anti-Salix crowd. As much as pro-Salix individuals and organizations have fervently defended the use of Salix for the relief of EIPH (Exercise Induced Pulmonary Hemorrhage) the problem is that the rest of the world doesn’t race on it and none of these “foreign” horses suffer in its absence. It is considered performance enhancing and unnecessary unless the horse is experiencing symptoms that limit his or her performance in which case that horse is retired. At first glance the statement “moved to the United States to race” seems somewhat acerbic in nature however this has apparently been going on for some time. This makes North America look like a disposal ground for spent goods. Long gone are the glory days for the “Old Kentucky Home” of born and bred champions of the “Sport of Kings”. Nowadays it’s more akin to the “Old Kentucky Crack House” of junkies. Similarly in Great Britain the use of Salix in training is virtually non-existent. These are examples of “clean racing” unlike in the United States where Salix is nothing more than a drug crutch; a crutch that that serves as an expedient; a means to an end – not necessarily a principled or ethical one – and suggestive of substandard or inappropriate care. 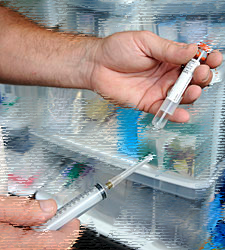 In the end, drug use is simply not the answer to the management of bleeding as has been proven time and again in European and other racing nations. When will the United States realize that the addiction to race-day and other medications has cast a shadow on the North American Thoroughbred, once lauded as the world’s best and now portrayed as the inferior species. Overall, foreign racehorses are sounder as evidenced by significantly lower breakdown rates. The high breakdown rates in the United States are considered to be an unmistakable consequence of the misguided and needless use of both therapeutic and illegal drugs, including Salix and the ubiquitous “Bute”. Back in the pre-Salix days some horses ran 30 times a year. And let’s face it, North America’s racing reputation is overtly tarnished as far as the global racing circuit is concerned – a culture of drugs and lax regulation. But it is far worse than just Salix. One need only recall the recent spate of positives in several states with the drug Dermorphin, a powerful painkiller isolated from the skin of South American frogs which is 30-40 times more potent than morphine; clearly unethical abuse and a diabolical exemplar of cheating. Nonetheless it will continue. The addiction is so powerful that it will override any sense of morality and a new potion will arrive on the scene; one that will stealthily go undetected only because it will be novel and without a procedure in place to test for it. Always one step ahead of the law. And so it seems Salix is merely a distraction. Why then is Salix the primary focus in North American racing these days? First and foremost because the rest of the world prohibits the administration of Salix on race day but secondly, and perhaps more importantly, because it is legal, it generates lots of money and it is not the worst of what is really happening in drug-dependent North America. Without a doubt the key word in this list of reasons is “MONEY” in very big capital letters. It is easy to focus on this glaring discrepancy between the North American racing industry and the rest of the world and with it the level of visibility it gains from an international perspective. It is also easy to defend it, which has been done since its introduction in the 1970’s. Interestingly enough the first Kentucky Derby horse to race on furosemide was none other than Northern Dancer in 1964. How fitting given that the inbred Northern Dancer’s pedigree is infused with the stained genes of unsound Native Dancer, both of whose bloodlines coarse through the veins of so many modern Thoroughbreds. 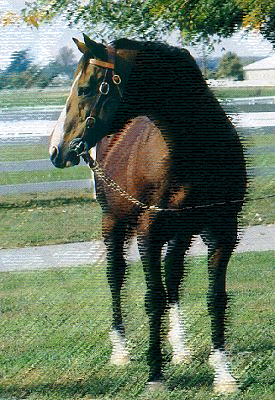 And by the way, Northern Dancer, touted as the “most influential stallion in Thoroughbred racing”, won the Kentucky Derby that year but only by inching out Hill Rise by a neck. The first Kentucky Derby horse to race on furosemide was none other than Northern Dancer in 1964. He won by a neck. Is Northern Dancer where North America’s current culture of cheating with drugs started? Did Salix and the corresponding weight loss give him the estimated extra 3 to 5 length advantage allegedly conferred by the drug and would he have won it if he hadn’t raced on it? After all, none of the other horses ran on Salix and therefore hypothetically all at a recognized disadvantage. Isn’t that why the vast majority of trainers in North America insist their horses run on it even if unnecessary? This was the beginning, the beginning of the end for North American racing. One need only look at the effects of furosemide on bone growth to see that the disadvantages of its use in the horse far outweigh any advantage conferred. Moreover does any trainer in North America know how to train a horse without it? It is a case where these so-called “horsemen” put their own economic interest before the horse. It is also clearly “The North American Way” – ergo, it will be. The rest of the world is wrong, simple as that, can’t anyone see? And in consequence of this allegation the rest of the racing world is inhumane, the common and droning catchphrase cited for its use, regardless of the fact that prior to the advent of this “miracle” drug all North American horses ran without it. Doesn’t it follow then that North America was once inhumane as well? That’s a lot to swallow. All bets have it that the current state of Thoroughbred racing in North America is vastly more inhumane than it was prior to the introduction of Salix. All one has to do is look at the decline in the number of starts the average horse makes and the unmistakable escalation in catastrophic breakdowns which, by the way, are far in excess of other racing jurisdictions on a global basis. Nevertheless the omnipresent mantra of the pro-Salix contingent is that all horses experience bleeding to some degree and therefore it is inhumane to withhold Salix for the purpose of mitigating EIPH. In spite of this, these alleged “altruists” want the public to believe that if horses are not given an injection of Salix on race day a blood bath on the race track will prevail. A post on Tuesday’s Horse in June of this year “Blood will spurt from horse’s noses if you ban Lasix they cry in Kentucky” reports this ludicrous claim. “Thoroughbred owners and trainers voiced dire warnings Tuesday about the potential of blood spurting from horses’ noses if the Kentucky Horse Racing Commission institutes a race-day ban on the anti-bleeding drug furosemide. Incredible; this declaration is enough to render one speechless. Curlin won the 2008 Dubai World Cup by a record 7-3/4 lengths competing against the world’s best horses all without Salix and to no ill effect. And so North America predictably continues to pay no heed to the transparent reality that Salix is banned in every racing jurisdiction around the globe without any evidence of blood spewing forth from the nostrils of the horses – deaf ears and closed minds. In fact many North American horses have competed successfully without Lasix in foreign racing events without incidence. 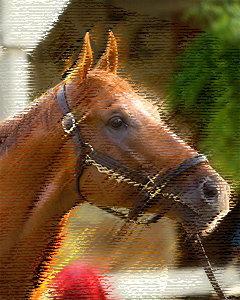 One example is Curlin and his record-setting 7-3/4–length victory in the Dubai World Cup in 2008 – the world’s richest race at Nad al Sheba racetrack – competing against the world’s best horses from around the globe. Now, however, the proof is in the pudding. On July 19, 2012 forty-two prominent Thoroughbred owners and partnerships upheld their opposition to race-day medication and made a praiseworthy commitment not to run their 2-year-olds this year on Salix. So far no issues reported, no bloody disasters or any catastrophic events related to EIPH. Moreover, the recently created Jockey Club website “Clean Horse Racing” (http://cleanhorseracing.org/) maintains a daily update of the most current performers in North America winning without Salix; there appear to be no shortage of winners and miraculously no blood. What a concept. North America’s legal race day meds – Salix and Bute – synergistically working to enfeeble the race horse all in the name of greed and ego. But that’s not all. To add insult to injury, the pro-Salix delegation, enmeshed in paradoxical rhetoric, are adamant that Salix is not performance enhancing. It is simply incredulous that they fanatically deny this. That said, how can performance enhancement be completely ruled out? Who is kidding who? The issue of weight is recognized on an international level and is fundamental to handicapping as a means of balancing a race on a competitive level depending on the perceived racing abilities and past performance of the individual horses in the field — the purpose being to make the outcome more difficult to predict. Any means of reducing the weight the horse carries will decidedly provide an advantage. This is no doubt the very reason that the vast majority of horses in North America race on Salix regardless of whether it is genuinely a necessity, otherwise they may be at a disadvantage compared to those horses that receive the injection. What is especially appalling is the glut of physiological issues that accompany the obligatory injection of North America’s golden racing elixir. A most insightful comment made by Tracy Farmer, vice chairman of the Kentucky Racing Commission, in his recent article: “Horse Racing’s Medication Choices” hits the nail on the head when it comes to the destructive relationship between Salix and chronic breakdown issues observed in North American racing. The front legs of Kentucky Derby and Preakness winner I’ll Have Another Friday, June 8, 2012 at Belmont Park NY. I’ll Have Another’s bid for a Triple Crown ended with the shocking news that he was out of the Belmont Stakes due to a swollen left front tendon. The New York Times later exposed this to be a false report by the horse’s connections. It was stated shortly thereafter that the 3-year old colt had the onset of osteoarthritis and the legs of a 20-year old. 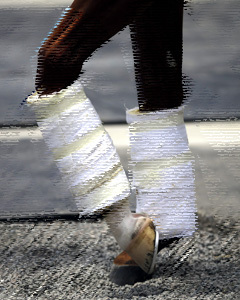 Unfortunately a shot of calcium, often prescribed post-race, will not stop the leaching of calcium from the bone or increase the amount of calcium stored but will simply be flushed out of the system. Calcium levels in the blood are regulated by a feedback looping system via specific hormones that act as chemical messengers. With the influx of calcium from an injection, these hormones recognize this as excess blood calcium and activate the appropriate calcium-sensing receptors such that much of it is quickly eliminated to maintain blood calcium homeostasis. Therefore this is not a quick fix for the losses incurred as a direct result of Salix usage. With chronic use, such as that occurring in the North American Thoroughbred due to the abusive use of Salix, a persistent state of calcium deficiency can potentially be established. With continuous resorption of calcium from the bone this invariably leads to chronically reduced calcium supplies and in turn reduced bone density, abnormal bone formations and susceptibility to fractures. It is much more complicated than this but you get the picture. Salix is literally killing the North American Thoroughbred. The science is there but no one is listening. How long can the pro-Salix crowd run away from the truth? They are unfailingly taciturn in response to the real arguments. I find it chilling that these people can be so uncaring about the welfare of our Thoroughbred horses. The pro-salix crowd sounds and acts just like the pro-slaughter crowd in their blindness to facts. Just makes me CRAZY. Thank you Jane. This is indeed terrific. I can hardly wait for Part 2, the Money, to be published. Big Pharma invades every sector of human existence, the false god of our times. 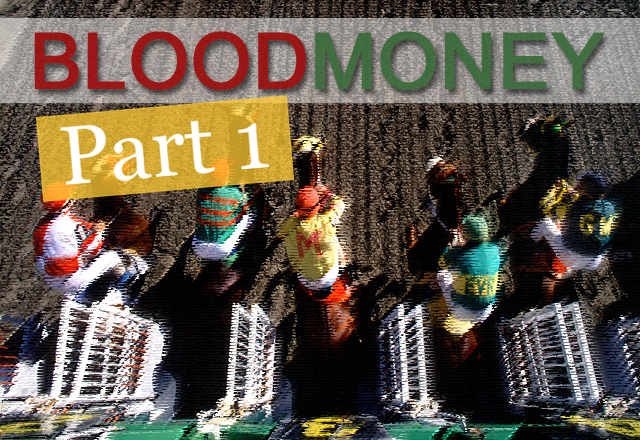 Wait to you see the chunk of change they make off horse racing! Thanks for this thoughtful, well-written essay. Can’t wait to see and share part ll.